For those looking for the right engine for their equipment or for an option to extend the life of their equipment, purchasing a remanufactured Perkins engine can provide benefits that new engines may not be able to provide. Integrating a new engine can leave your equipment down and unusable for some time – costing your business money and productivity. Replacing an existing engine with a reman frequently takes significantly less downtime to get equipment up and running again. Remanufactured engines are also not subject to the same high level of EPA Emissions rating that new engines are required to meet. Since reman engines aren’t new, they are only required to meet original emissions requirements for that engine. For some equipment, this allows more efficient operation and it prevents a still-useful core from being sent to a landfill. 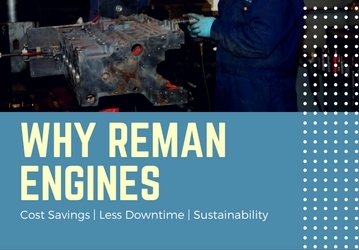 One of the biggest factors in choosing a reman engine is the cost savings it offers over purchasing a new engine. Significant savings can typically be achieved by choosing to remanufacture an existing engine or purchasing a reman engine.